I awake with a start, anxious to know what time it is. We have an appointment this morning, so the time matters, but we don’t have to be there until 10. It is rare these days to have a timeline in the morning, so my subconscious, remembering only that there is a deadline, jolts me awake. We get up leisurely, once my brain acclimatizes, and get ready for the day. I brush my teeth, a task slightly more complicated than usual this morning. Two days ago, we added bleach to the remaining few gallons of water in our tank to “shock” the system and rid it of stinky bacteria build up. The “shocking” process should have ended yesterday morning with a delivery of 100 gallons of new tasty fresh water, but the delivery did not appear. So this morning we are down to the last few gallons of potable water. I splash a bit in a cup to rinse and spit, hesitant to waste any. We are just about ready to go – sunscreen slathered, bottles watered, shoes located – when a panga pulls up and calls out. Our water has arrived. Well, 1/3 of our water. The panga pulls up alongside Halcyon and hauls seven 5-gallon jugs over the rail to John, who hastily pours them through a funnel into our deck fill. The panga promises to bring the remaining water tomorrow and zooms off, rocking Halcyon in its wake. We stash phones, wallets, cords and books in waterproof bags, launch the dinghy and head to shore. 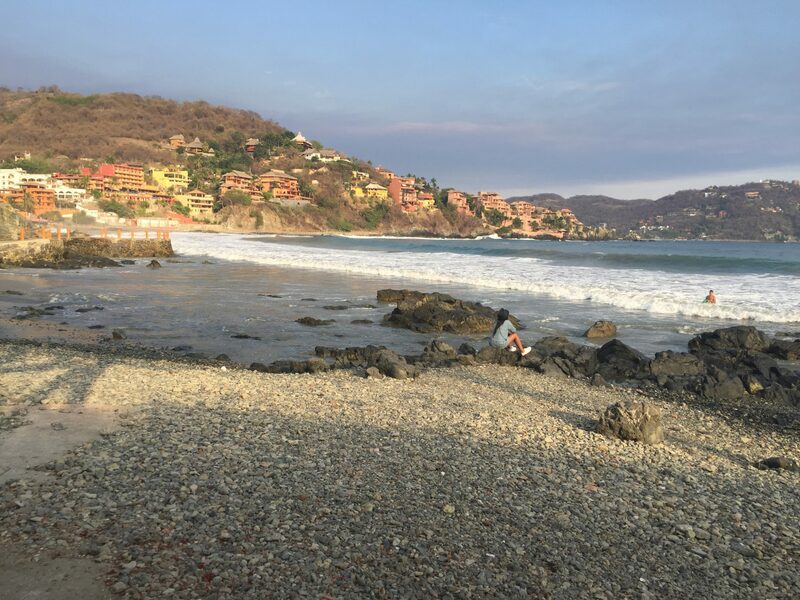 The only pace to land a dingy in Zihuatanejo is on the beach, on the other side of those breaking waves. This means dinghy landings are sometimes mellow and easy; other times they are exciting and adrenaline inducing; and always they are salty and sandy. The landings are made easier by a set of dinghy wheels, clever contraptions that attach to the stern of the dinghy and allow its occupants to dispatch essentially wheelbarrow wheels that extend lower than the leg of the outboard motor. Upon surf approach, the wheels touch down first, protecting the propeller and assisting the occupants in hauling the boat out of the surf zone and then up the beach with minimal seawater immersion (stuff or people). We have these fancy contraptions, but they are currently out of service (ahem, John?) so we are rocking it old fashioned, which requires better timing through the swell and brute strength up the beach. The swell is down today, though, and our landing is uneventful. We toss 10 pesos ($0.50) to Carlos, the resident dinghy-watcher, and head out to the main road, knocking sand off our feet as we go. We have important business this morning. After 15 hours of drift/sailing, 3 days of inquiring and researching, 2 hours of frantic ordering and 3 weeks of waiting and UPS pestering, the parts to fix our 40-year old slipping transmission have arrived. This morning, we are headed to our mechanic’s shop to watch the rebuild process, impart what little knowledge we have, and mostly stand around awkwardly in the way. We have vague directions. I make eye contact with a taxi driver and lean through the window to try to explain where it is we are going. I pull up google maps and end up giving him turn-by-turn directions into the hills behind Zihuatanejo. He has to kill the AC to make it up the hills, steep enough to warrant stairs, by no means of legal grade in the states. Instead of finding the road on the map, we find dead ends. So we pay him with a smile and continue on foot – in fact the road we need had been turned to stairs, drastically too steep for anything with wheels. We find what looks to be the right corner and slump down in the shade. I text Filipe, the mechanic, who is off buying screws and will return, he says, in 30 minutes. It is a thrilling and terrifying moment to see our transmission, strewn across a cluttered makeshift worktable in a thousand pieces, the box of new parts unopened next to it. Filipe gets to work. With botched Spanish and strange hand motions, John attempts to impart the crucial pieces of information passed down from the mechanic in the states that sent the parts. This is not an easy rebuild. Filipe nods along, though it’s never clear how much of the charades game gets through. We step back and watch. An hour in, Filipe packs up the set of transmission innards he has been wrestling and shoots off a string of Spanish about needing a tool at his friend’s shop. He will be back in 30 minutes, we can wait. Two hours later, hot hungry thirsty and very bored, we text Filipe, who casually mentions it may be another hour before his return, and head off in search of food. I can tell we’ve been in Mexico for a long time now; this waiting has not made us antsy, frustrated or upset. I feel lethargic after zoning out for several hours, but mostly I just feel hungry. At the bottom of the hill we find a small open Cocina and guzzle guayaba juice, chicken mole and fajitas. The final bill is 120 pesos ($6). Back at the shop, Filipe has returned but quickly realizes it will be necessary to undo much of the rebuild just completed because a washer has shifted. With only a sigh indicating what must be his immense frustration at unbuilding several hours of work, he unbolts the housing. We are not particularly contributing to the process, and it is painful to watch the parts disassemble once again. We take our leave, with a handshake and a “muchas gracias” to Filipe, and grab a taxi back towards town. He assures us the rebuild will be done at the end of the day, and ready for install the following morning. The taxi drops us in front of one of the larger Ferreterias (hardware stores) in town for some PVC pipe for a new engineering project John has in mind to scrub the month’s worth of growth from our anchor chain as we recall it. From there, we stop at a few stalls in the market for some fresh fruits and veggies then wander through town towards the dinghy. It takes a long time to get there, though, it would be rude not to stop and chat with our friends. Cruising, we don’t often stay in one place for long. Almost every trip to the grocery store, every venture tracking down a part, every restaurant is a new experience with some amount of unknown built in. But we’ve been in Zihua long enough now (coming up on a month) that it has become familiar. We greet the shop owners, we know where to get sheets of aluminum, we have friends that stop us in the street. So as we stroll through town (because even if you’re in a hurry, you don’t walk fast here), we pass by the museum where Oscar works and he invites us in to rest. We talk about the upcoming fishing tournament, his family and the weather; he regales us with nearly unbelievable histories of drama, corruption and scandal in Zihua. A few blocks further, cruisers that just pulled in yesterday are drinking coffee and smoking cigars. We sit with them and discuss boat projects and plans. As we get up to drift off, the owner of the coffee shop appears and thanks us for the tuna we gave him last week (we still have more in the freezer than we can eat!) and we end up talking about various tuna preparation methods. Eventually, we pull ourselves away in the easy casual manner of Zihua because we have agreed to sundowners on Halcyon with cruising friends Jason and Jen, and sundown approaches. Back on the boat, I hang up the solar shower, grab the soap and dive into the refreshing salt water of the bay. Nothing feels better after a long dusty day. Scrubbed and shampooed, I hop out and rinse with the fresh water solar shower to de-saltify (if only for a moment…). Jason and Jen dinghy over, bearing crackers and hummus and wine and their own glasses (supplying your own dishes is a common courtesy on cruising boats that all have hands for dishwashers and a finite amount of water for washing). The talk mostly hovers around plans for hurricane season, fast approaching. They are leaving in the morning for ports south, the 6th boat to come into the bay and leave again since we arrived. We are anxious to make tracks south and catch up with our friends. Tomorrow we hope Filipe will arrive to install a shiny rebuilt and functioning transmission, an obvious prerequisite to us being able to get out of here. But tonight we enjoy the company of likeminded cruisers as the boat sways in the evening swell. Zihua has been a great home for us this month, and I can’t think of a better spot to be “stuck”. The winds call us to pull up that anchor (scrub it well on the way up!) and hoist the sails, but I know I will miss this place when we are gone. Transmission problems are the worst. We had our transmission clutch pack die 6 months after buying our boat (31 years old at the time, but not original transmission I believe). It’d be great to hear a bit more about the lead up to your transmission issues. Did it start slipping completely over a very short period of time? Where was the 15 hours of drift sailing? Harbor Marine in Everett rebuilt ours. Hey Patrick, thanks for the comment and for reading along! While we were on passage from Manzanillo to Zihuatanejo, we were motoring along find and suddenly the transmission slipped and the engine revved up. We dropped it in neutral to investigate, didn’t find anything obvious, so put it in forward again. We had gone maybe 2 more hours and it happened again, and once more a few minutes later. At this point we were concerned about damaging the transmission any further, so we cut the engine and hoisted the spinnaker to eek out whatever speed we could from the 4-8 knots of breeze. We did have favorable current, which helped quite a bit. We drift/sailed the rest of the way to zihuatanejo and started looking for a mechanic. Once or twice before we think the transmission had slipped but we hadn’t been able to recreate the problem in order to troubleshoot it until this incident. We ordered parts from Federal Transmission Center out of Chicago, and had some local mechanics rebuild it and they did a really great job! She’s been running great ever since. It is definitely a big job, but it’s nice to have it behind you so you don’t have to worry about it now. What kind of boat do you have? Are you planning to go cruising? Yup, we’re cruising in the PNW. I found your blog through 48 North. We have a C&C Landfall 38. If you want to check out my blog it should be linked on my name in the comment. (and the search box there will pull up our transmission story if you want to read it). Yep I still feel like I am right there with you. Thanks for shoring your adventure! I always look forward to the next chapter! I am still in awe of your adventures. Thank you for sharing. Keep safe.